Expedia can help you save loads with Mendoza Wine Region travel packages. With all that extra money in the bank, you might even like to book a few extra nights. Wouldn't it be nice to save up to $200*? Purchase your family's travel package on Expedia today! Search our universal database of more than 400 airline partners and 321 000 properties worldwide. Too many to pick from? Don't stress — we'll help you decide! 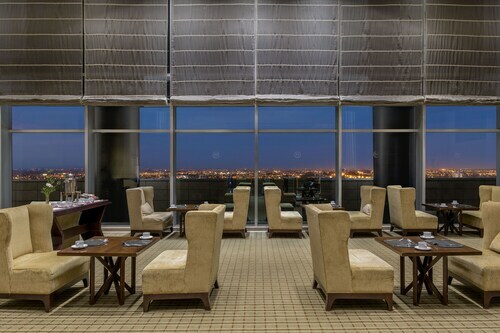 You can cancel or change almost any reservation and you won't have to pay a cancellation fee to us. Getting ready to go on your Mendoza Wine Region holiday? Not sure what to add to your travel schedule? Don't fret — we're here to give you a few pointers. Take off into the wider region and get close to nature with activities like snowboarding. Still got time to spare? If you're really hoping to go home with some lasting holiday memories, throw skiing on your agenda too. We all know you don't go travelling to sit in a small seat on a plane and sleep in a strange bed. Holidays are all about the cool things you can do while you're there! Got some time up your sleeve? Head to our Mendoza Wine Region things to do page for a full list of activities. San Rafael Airport (AFA) can be found 35 miles (56 km) south of the main area of Mendoza Wine Region. Find your luggage slide into a cab and let the good times roll! See the best of Argentine art and enjoy a free concert at one of Mendoza’s favorite attractions. Visit Mendoza’s cultural heart to see museums and basilicas or simply sit in the shade with an ice cream and watch the entertainment in the plaza. Unwind in one of Mendoza’s most beautiful public squares, given to Argentina by the Spanish government. Find a quiet place to enjoy a siesta in this peaceful park, complete with a playground and a monument to the city’s Italian heritage. Just a short walk from Mendoza’s downtown, this square is home to a monument that pays tribute to Argentina’s most beloved general. This historic theater facing Independence Square attracts visitors with its pleasing neoclassical architecture and entertaining shows. Leave a tribute to the revered Virgin of Cuyo at one of the most important churches in Argentina. Experience Argentine viticulture, sample a selection of fine wines and dine on exquisite cuisine while visiting this 19th-century wine estate. Walk or cycle around this expansive park to see the glistening lake, pay your respects at the war memorials and enjoy a great view of the city. Shop for groceries and browse a selection of foods, spices and artisanal goods at this bustling market in the heart of Mendoza. Taste award-winning wines and tip your glass to the Catena family at one of the world’s leading wineries, famous for its high altitude and Malbec vintages. Modern facilities complement centuries-old vineyards at this Argentine winery, renowned for its Malbecs and crisp sparkling whites. 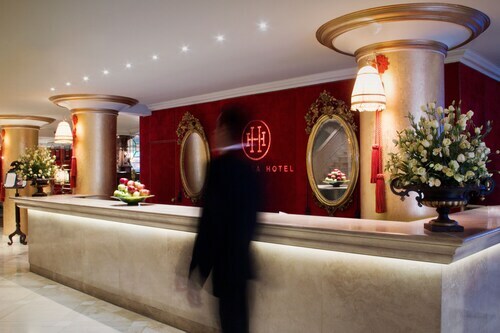 Located in Historic Center, this luxury hotel is 0.1 mi (0.1 km) from Independence Square and 1.8 mi (2.9 km) from General San Martin Park. Teatro Independecia and Municipal Museum of Modern Art are also within 5 minutes. Belgrano Station is 8 minutes by foot and Mendoza Station is 11 minutes. Located in Historic Center, this spa hotel is 0.2 mi (0.4 km) from Plaza Italia and 1.5 mi (2.5 km) from General San Martin Park. Pasado Cuyano Museum and Chile Square are also within 10 minutes. Belgrano Station is only a 2-minute walk and Mendoza Station is 7 minutes. 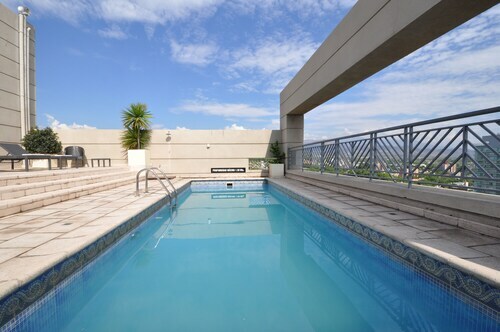 This family-friendly Mendoza hotel is located near the airport, within a 5-minute walk of Avenida San Martin and Peatonal Sarmiento. General San Martin Park is 2.2 mi (3.5 km) away. Belgrano Station is 16 minutes by foot and Mendoza Station is 22 minutes. 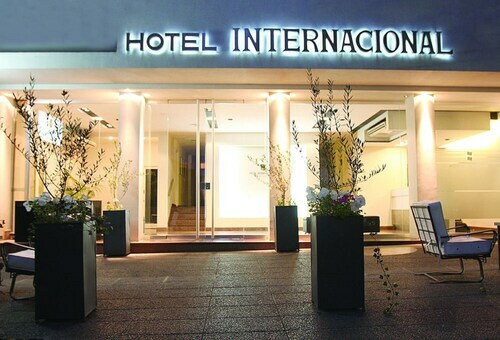 Located in Historic Center, this hotel is 0.1 mi (0.1 km) from Avenida San Martin and 2.4 mi (3.8 km) from General San Martin Park. San Martin Square and Espacio Contemporáneo de Arte are also within 5 minutes. Mendoza Station is 11 minutes by foot and Belgrano Station is 18 minutes. 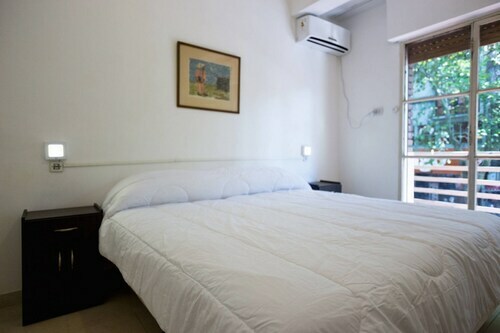 Located in Historic Center, this hotel is 0.1 mi (0.1 km) from San Martin Square and 2.2 mi (3.5 km) from General San Martin Park. Espacio Contemporáneo de Arte and Basilica de San Francisco are also within 5 minutes. Mendoza Station is 12 minutes by foot and Belgrano Station is 15 minutes. Located in Historic Center, this hotel is 0.2 mi (0.4 km) from Plaza Italia and 1.5 mi (2.5 km) from General San Martin Park. Pasado Cuyano Museum and Chile Square are also within 10 minutes. Belgrano Station is only a 2-minute walk and Mendoza Station is 7 minutes. Located in Historic Center, this spa hotel is 0.1 mi (0.1 km) from Avenida San Martin and 2.2 mi (3.5 km) from General San Martin Park. Peatonal Sarmiento and Spain Square are also within 10 minutes. Belgrano Station is 15 minutes by foot and Mendoza Station is 21 minutes. Located in Historic Center, this hotel is 0.2 mi (0.4 km) from Plaza Italia and 1.6 mi (2.5 km) from General San Martin Park. Chile Square and Teatro Independecia are also within 5 minutes. Belgrano Station is only a 3-minute walk and Mendoza Station is 7 minutes. Sun., 1 Sep. - Thu., 5 Sep. Sun., 29 Sep. - Sun., 13 Oct.
Wed., 2 Oct. - Wed., 16 Oct. Sat., 28 Sep. - Sat., 12 Oct. Thu., 1 Aug. - Sun., 1 Sep. Mon., 9 Sep. - Mon., 30 Sep. Tue., 10 Sep. - Wed., 27 Nov. Looking for Flights, Hotels, Car Hire and Holiday Rentals in Mendoza Wine Region?